Basketball; a game that began in a YMCA by Dr. James Naismith, has grown internationally to become one of the most popular sports on the planet today. To become a solid basketball player you need coordination, athleticism, skill, and speed. How much you improve as a basketball player will often be determined by the hours you put into the game. Having a basketball hoop at your home or nearby will be crucial to enhancing your skills. 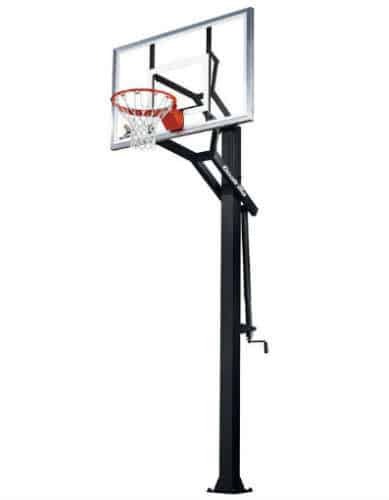 This allows you to work on your game, practice your moves, and shoot the basketball with proper form. Today, there are several different basketball hoops to choose from. So, how do you find the best basketball hoops? Well, you need to look at your needs, the quality of the hoop, features, and price. 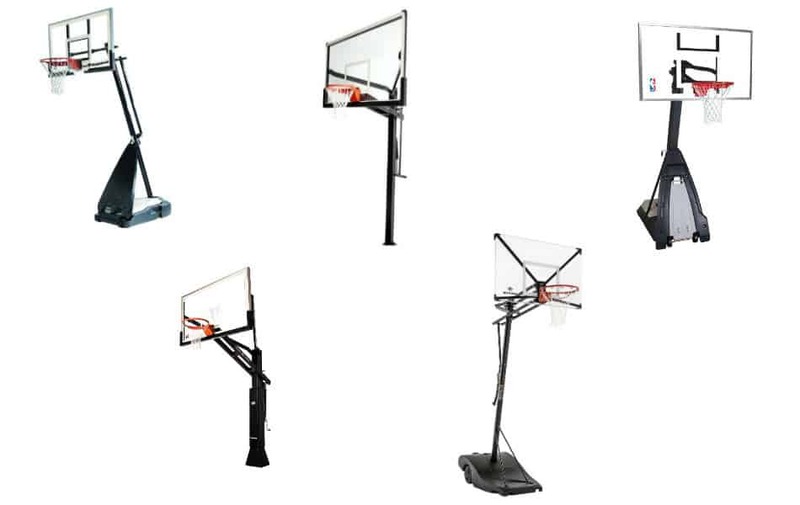 We have made your search easier by selecting what we feel are the best basketball hoops available on the market today. We hope you find our site helpful and that you find the best basketball hoop that will help you become the player you want to be. 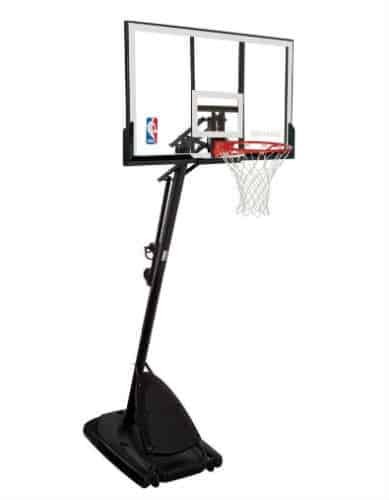 The “Beast” as the name implies is the top of the line portable basketball hoop offered by Spalding. 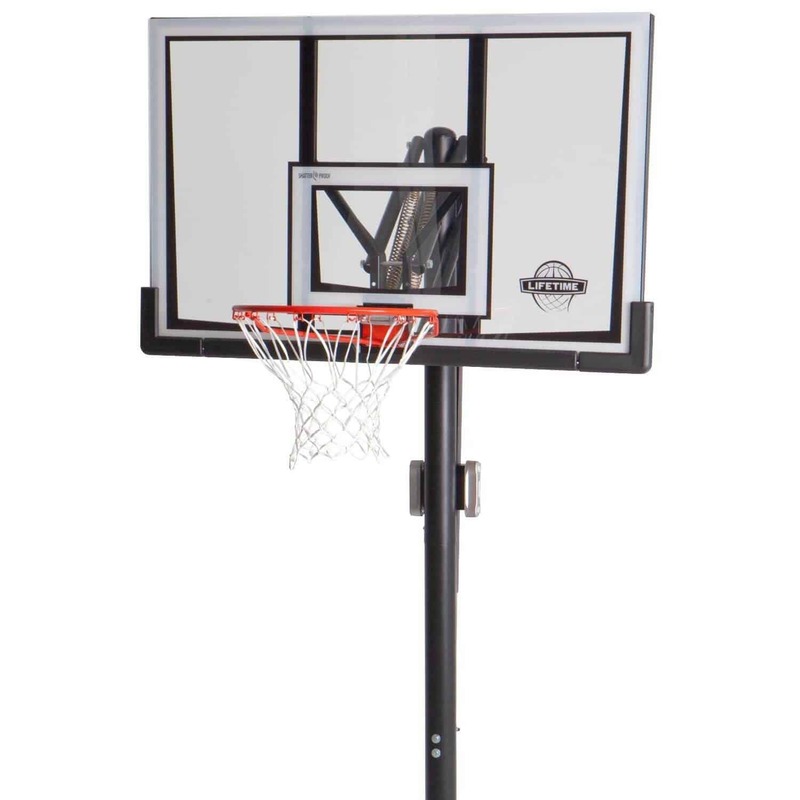 With a 60 inch tempered glass backboard and two-piece support pole system, this is the behemoth to get if you want a portable hoop and are serious about the game. First Team is not one of the more recognizable names in basketball hoop manufacturing, but maybe they should be. 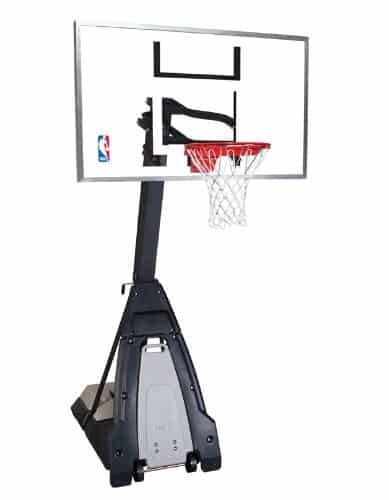 The Game Changer In-Ground Basketball Hoop is made from top quality components and is easy to operate. If you are in the market for a premium in-ground hoop you’d be mistaken to not seriously consider this system. Silverback is a great mid-tier in-ground basketball hoop brand and the SB-54iG is one of their most popular models. The 54 in the hoop’s name stands for 54 inch, which is the size of the backboard. 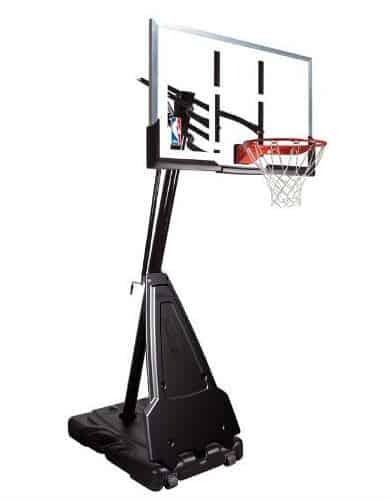 The padding on the support pole helps protect players who are driving to the rim during intense pickup games. 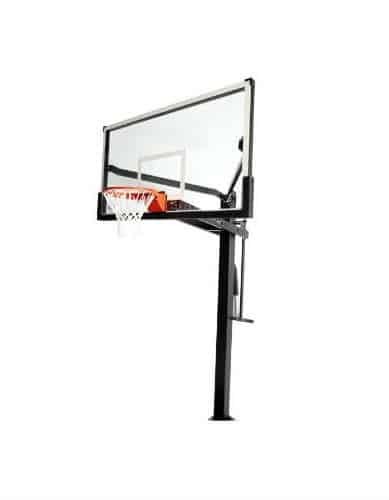 The Lifetime 71281 In-Ground Basketball System is perfect for families who want a decent hoop to play on at a great price. Certainly not up to par with the more expensive units, this hoop is best for those that simply want something for shooting sessions. Goalsetter may not be a household name, but don’t sleep on their All-American Basketball Hoop’s quality. Adjustable from 6 to 10 feet, this hoop is great for all ages and abilities. The support pole is angled to help the hoop’s frame flex during dunks, making it one of the most durable basketball hoops that money can buy. Goalrilla, the big brother to the Silverback hoop brand, makes some serious in-ground basketball systems. The GLR GS 54 is great for those who want something that will last for years to come. With a smaller backboard, this hoop offers top of the line quality at a slightly lower price than other high-end systems. While Spalding makes high-end hoops like The Beast, they also make a great value hoop as well. 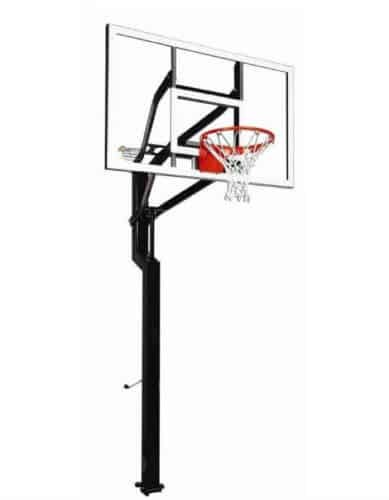 The Pro Slam fits the bill perfectly with a recreational level breakaway rim and a three piece round support pole system. The base for this portable basketball hoop is a respectable 37.5 gallons. 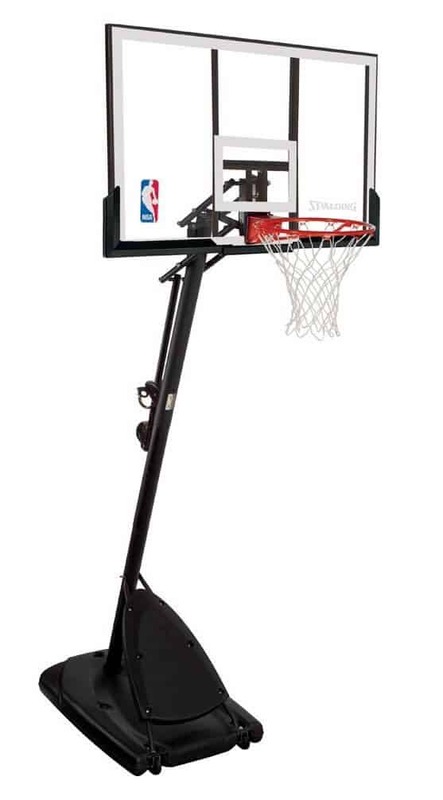 The bigger brother to the SB-54iG, the SB-60 is an awesome basketball hoop for under $1,000. Featuring tempered glass and a 60 inch backboard this thing is no joke. To top it off it comes with a 7-year limited warranty. At the mid-tier for in-ground basketball hoops it will be hard to beat the quality and value that the Silverback SB-60 provides. 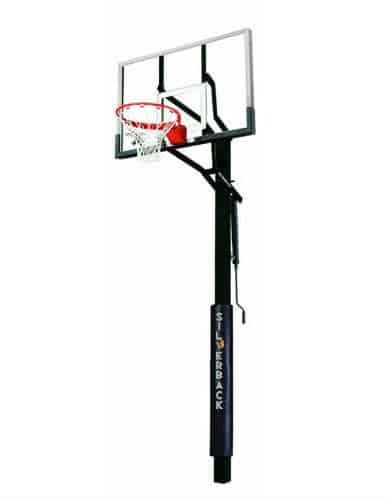 Our favorite in-ground basketball hoop on the market, the Lifetime Mammoth has it all (except for support pole padding). 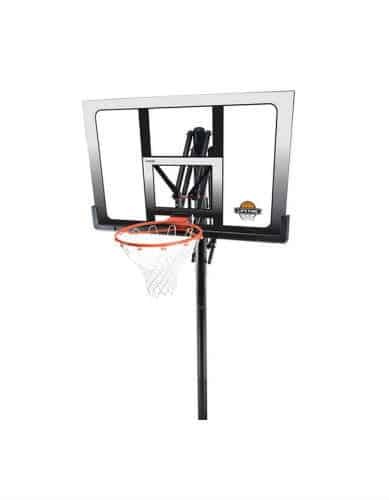 This hoop comes in three backboard sizes: 52 inches, 60 inches, and 72 inches, so there is a version of this hoop that is sure to fit your needs and budget. For many years Silverback has been known as the best mid-tier in-ground basketball hoop manufacturer. They’ve now expanded into the portable basketball hoop market with the NXT. This portable basketball hoop has several unique features that can’t be found on other portable hoops, and it is one our favorite new hoops to come on the market in a long time. Not one of Spalding’s most popular in-ground hoops, but this in-ground system should not be ignored. 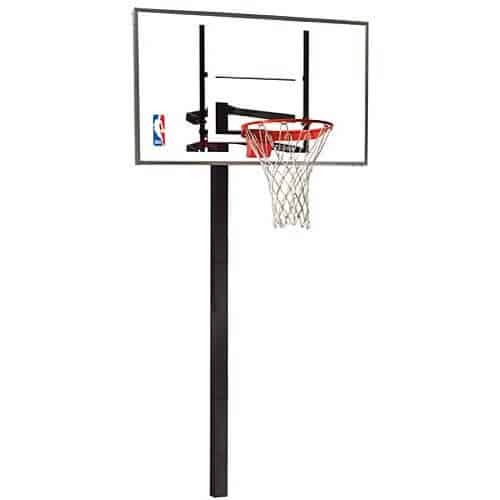 It offers unique features for a mid-tier price including a 54 inch tempered glass backboard and a two-piece square support pole. Back in the day, it seemed like everyone had a wall-mount hoop attached to their garage. Today these have become less popular compared to portable and in-ground systems. 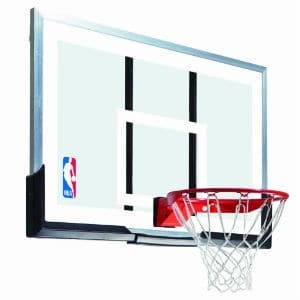 However, if you are interested in a wall-mount system the Spalding 54 Inch Backboard and Rim Combo is your best bet. 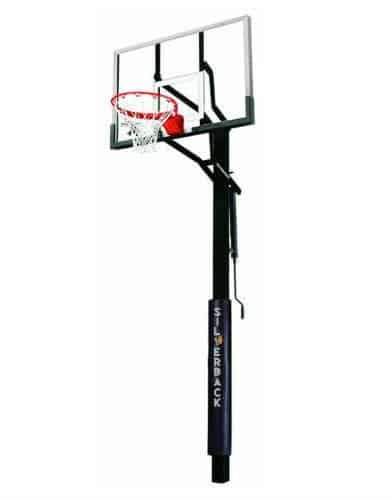 A wonderful mid-tier portable basketball hoop, the Spalding 60 Inch Portable Basketball System is great for those developing their game. A step up from the Pro Slam in terms of rim quality and backboard, this portable system makes a great choice for those who need a good hoop, but don’t want to spend the money to buy a Spalding Beast. Picking the best basketball hoop for your home is a big decision which you should not take lightly. Because this is an expensive purchase it is critical to do your research and understand the differences between basketball hoops in regard to material and features at each price point. Taking time to recognize your needs will be the best thing you can do to find a hoop that will be perfect for you and your family. Below we discuss a few of the major factors that will come into play when shopping for a new basketball system. If you are like us then the price of the basketball hoop is an important factor. At the low end you can find quite inexpensive options around the $100 price point like the Lifetime 1221 Hoop. 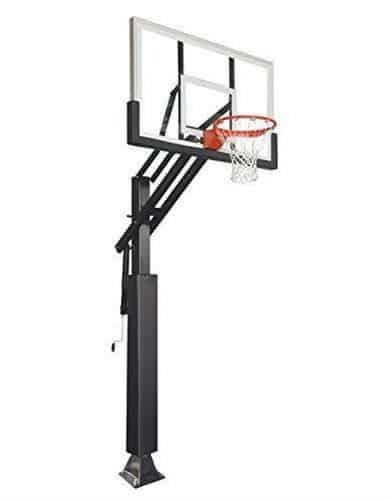 At the other extreme you have heavy-duty competition level basketball system including the top of the line Spalding Arena View Basketball Hoop, which can be priced higher than $2000 depending on the backboard material and other options you choose. 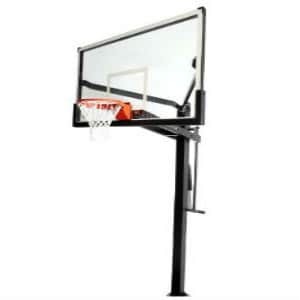 Thankfully, there are now so many different hoop brands and models that you can find a portable or in ground basketball system that will meet almost any budget. There are three main recreational basketball hoop types. These include the portable basketball system, in ground, and wall mount basketball hoop. Each of these have pros and cons. 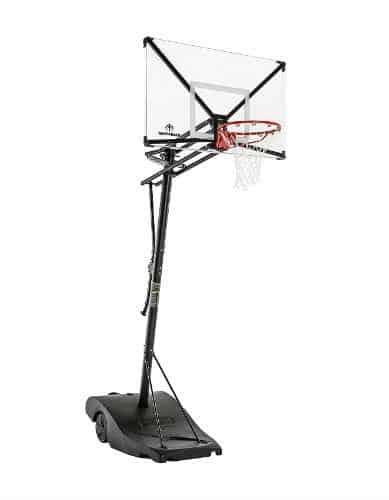 Portable basketball systems are easily transported and are recommended to those who may move regularly or want a system that can be moved out of the way for mowing, cars, etc. 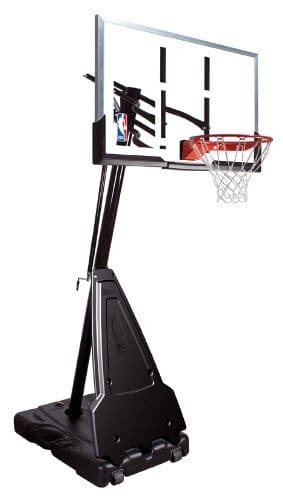 They also universally offer some form of height adjustment mechanism to help young ones develop fundamentals (or so dad can feel like Lebron for a moment by throwing down monster dunks at 8 feet). Often cheaper portable systems lack stability and may have less than desirable backboard performance due to poor materials and support. In ground hoops are another common basketball hoop type you will see around. Like the portable hoops the in ground basketball systems often offer a height adjustment system. 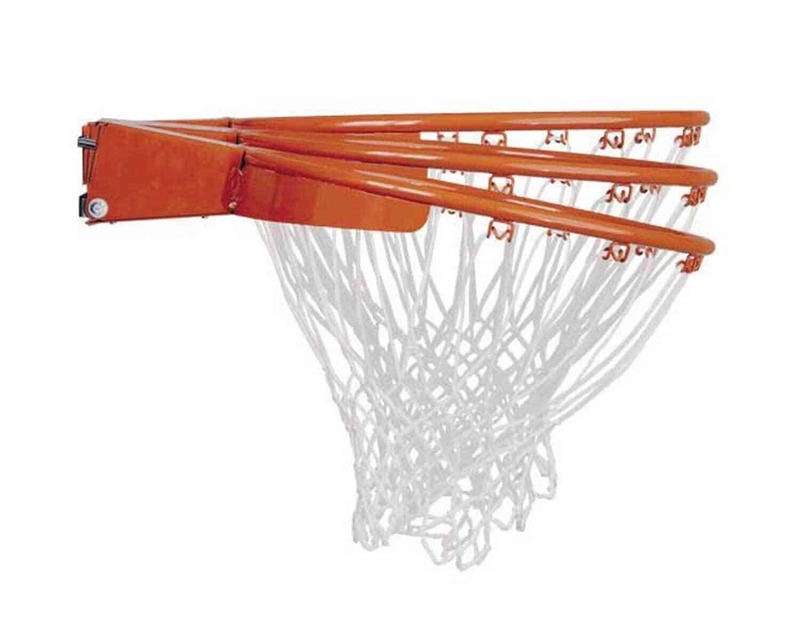 In ground hoops often have superior backboard performance and support setups when compared to portable basketball hoops. These hoops can be more difficult to transport and are often stuck in the place they are installed. If you are looking for an expensive hoop, the in ground basketball hoop offers the most options. 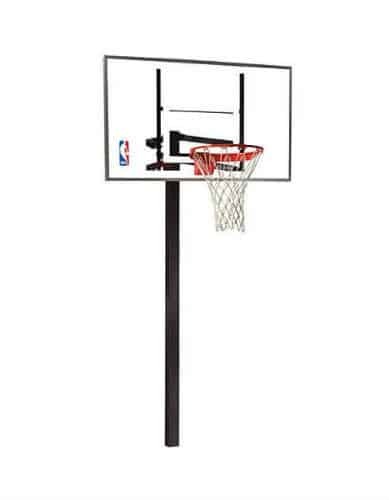 The third basketball hoop type is the wall mount. This type of basketball system has become less popular over time and there are currently few options. One such option is the Spalding NBA Rim and Backboard Combo. A pro for these type of systems is that they are often relatively cheaper due to not requiring a support pole. They also tend to have decent backboard performance from a support bracket. A limitation of these hoops is that you do not have the height adjustment ability that comes with in ground and portable basketball hoops. When it comes to basketball hoops there are three types of backboard materials. 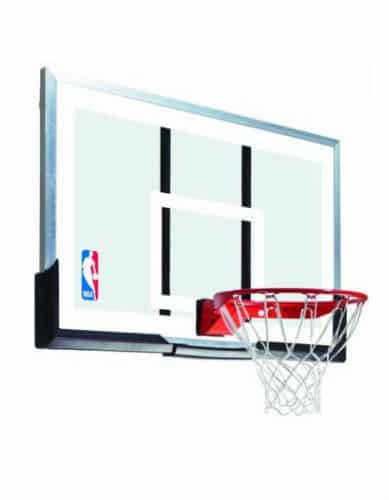 Cheaper basketball hoops generally feature smaller backboards (48 or 52 inches) made from polycarbonate. Polycarbonate is extremely durable and unlikely to break during normal usage. However, polycarbonate backboards have a tendency to feel dead when contacted with the basketball on shots. For buyers it will be important to decide what is more important when considering a basketball hoop with a polycarbonate backboard, durability or performance. Mid priced and some more expensive hoops have backboards made of acrylic. Acrylic is also a durable material and will perform noticeably better than its polycarbonate counterparts. 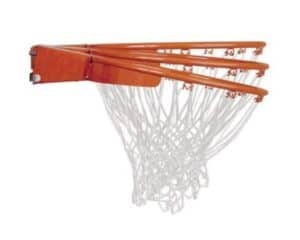 Yet, many basketball players who have spent hours in the gym getting better will note that the backboards made of acrylic still do not respond like the backboards in their local gym. 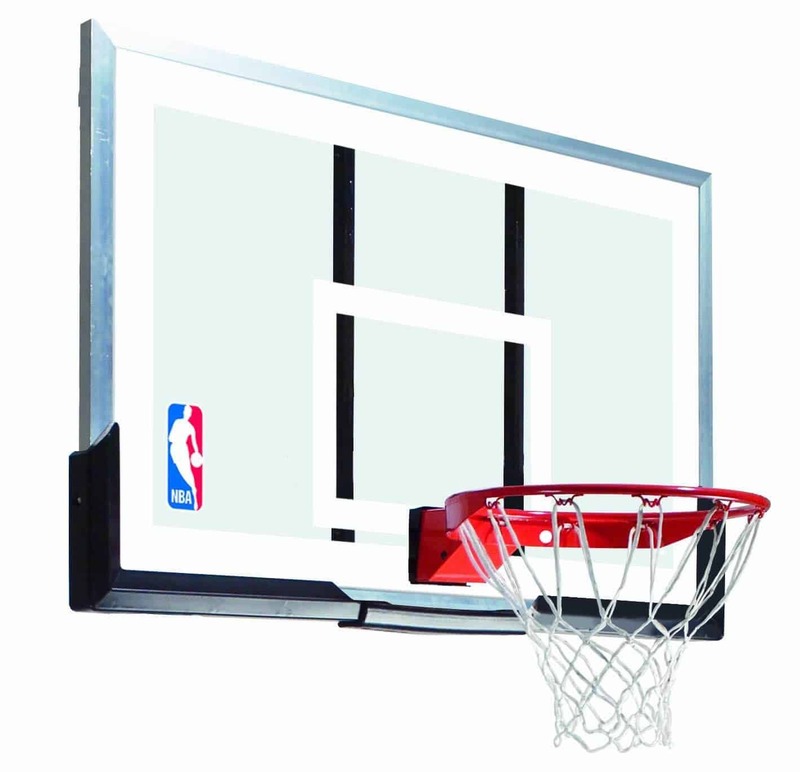 A solid choice for a hoop with an acrylic backboard includes the Spalding 60 Inch Portable Basketball System. The last and most expensive backboard material available is tempered glass. This is the heaviest material out of the three and is used on basketball hoops in gyms around the country for peak performance. It is worth noting that tempered glass is the least durable material you can buy for a recreational hoop, and you should expect that if the hoop were to be tipped or fall over that the glass will shatter. For this reason we do not recommend tempered glass hoops for families with children who are young or prone to rough play. If you want a portable hoop with a tempered glass backboard we recommend the Spalding The Beast Portable Basketball System. Many modern rims offer springs to absorb force from dunks. The rim is one of the primary parts of the basketball hoop. Over the past 30 years there have been some revolutionary advances in rim technology which last longer and allow for hard dunks. This is mostly due to the advancement of using spring supported rims that “breakaway” when dunked to minimize pressure from the slam and maximize durability. Most of the cheapest hoops will not feature any spring mechanism (see the Lifetime 1221 for an example), which means that if dunked over time the rim will likely either break or become warped. Hoops in the $300 to $500 range almost universally offer a spring enhanced rim. However, these are often not professional level and are designed with springs exposed, which can lead to rusting over time (see the Lifetime 1558 for an example). At the high end price range you will find higher quality breakaway rims with springs that are protected by a metal cover. The top quality rims offer a firm feel that will last for years to come (see the Goalsetter All American for an example). We have worked to put together this site as a guide for anyone seriously looking to purchase the best basketball hoops out there. The interactive chart above provides great information on each hoop so the your decision can be made easier. We also wanted to give you the opportunity to use the data to make the decision that meets your needs rather than simply be told what is best. Our links for each basketball hoop take you to the Amazon page for the product so that you can feel safe that you will be buying from a reputable company. We hope you find this information useful and good luck on your journey to getting the best basketball hoop for you!